FILE - A TV shows an image of North Korean leader Kim Jong Un while reporting North Korea's missile test which landed in the waters of Japan's economic zone in Tokyo, July 4, 2017. U.S. and Republic of Korea militaries fired missiles into South Korean territorial waters in direct response to North Korea’s intercontinental ballistic missile launch Friday. A statement from Eighth United States Army said the joint, live-fire exercise utilized the Army Tactical Missile System (ATACMS) and the Republic of Korea Hyunmoo Missile II. The weapons can be quickly deployed and provide deep-strike precision capability under all weather conditions, according to the military. A defense official told VOA the exercise began around 5:30 pm EST. A White House statement released shortly afterward called the North's missile test a "reckless and dangerous action" which will further isolate the country. The statement said "the United States will take all necessary steps to ensure the security of the American homeland and protect our allies in the region." North Korea’s intercontinental ballistic missile launch was the second such launch in just a few weeks. The latest launch flew higher and longer than the first ICBM Pyongyang launched on July 4. FILE - The intercontinental ballistic missile Hwasong-14 is seen during its test launch in this undated photo released by North Korea's Korean Central News Agency (KCNA) in Pyongyang, July 4, 2017. Pentagon spokesman Navy Captain Jeff Davis said North Korea launched the missile from Mupyong-ni arms plant in the country’s north. Defense officials in Washington and Seoul, as well as private analysts, said the missile was in the air for 40 to 45 minutes, reaching a peak altitude of 3,000 kilometers and traveling some 1,000 kilometers laterally before splashing down approximately 160 kilometers west of Japan's second-largest island of Hokkaido. Japan said the missile fell into its exclusive economic zone. Japanese Prime Minister Shinzo Abe termed Friday’s launch a “serious and real threat” to his country's security. After Friday’s unusual late-night launch, the top U.S. general, Chairman of the Joint Chiefs of Staff Gen. Joseph Dunford, and the head of U.S. Pacific Command, Admiral Harry Harris, called the Republic of Korea’s Joint Chiefs of Staff Chairman, General Lee Sun Jin to discuss military response options and reaffirm their “ironclad commitment” to the U.S.-Republic of Korea alliance, according to the U.S. Chairman’s office. South Korean President Moon Jae-in said the launch by the North “clearly violates U.N. Security Council Resolution and it is a grave threat to international peace and security." Moon added that “once again we urge North Korea to awaken from a vain illusion such as developing a nuclear program and missiles and instead choose a new path for a dialogue." 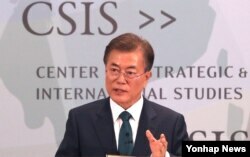 FILE - South Korea's President Moon Jae-In speaks at the CSIS seminar in Washington, June 30, 2017. 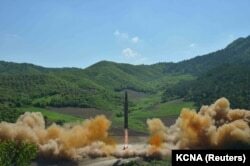 While the type of missile tested is yet unconfirmed, the preliminary data is “fully consistent with a Hwasong-14 tested with a larger second stage that is powered by a high-thrust engine,” according to Michael Elleman, senior fellow for missile defense at the International Institute for Strategic Studies. “If flown on a flatter trajectory, this missile could reach as far as 9,000 to 10,000 km,” [easily putting Seattle or San Francisco on the U.S. West Coast into range], according to Elleman, whose comments were published on the 38 North website of the U.S.-Korea Institute at Johns Hopkins School of Advanced International Studies. North Korea has carried out several ballistic missile tests over the past two years. Pyongyang, on July 4, launched a Hwasong-14 ICBM for the first time. That missile, lofted at a very steep angle, flew for 39 minutes and also landed in the Sea of Japan. Word of Friday’s missile launch came as a bill approved by Congress calling for tougher sanctions on North Korea, as well as Iran and Russia, landed on the desk of President Donald Trump. “The most worrying aspect is that the U.S. administration will not take this launch seriously due to preoccupation and in-fighting, giving North Korea more time to develop its program and more cause for U.S. allies South Korea and Japan to lose confidence that the U.S. will come to their aid,” Melissa Hanham, a senior research associate with the James Martin Center of Nonproliferation Studies of the Middlebury Institute of International Studies at Monterey, told VOA. 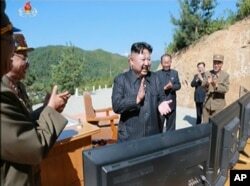 FILE - This image made from video of a news bulletin aired by North Korea's KRT July 4, 2017, shows what was said to be North Korea leader Kim Jung Un, center, applauding after the launch of a Hwasong-14 intercontinental ballistic missile, ICBM. The French foreign ministry, in a statement, called for fellow members of the United Nations Security Council, in response to the launch, to swiftly impose “strong and additional sanctions” against North Korea. VOA's State Department Correspondent Nike Ching and Northeast Asia Bureau Chief Brian Padden in Seoul contributed to this report.